Special Experience: flexible to choose your interested scenic spots and folk entertainment activities. Be met our private English-speaking tour guide at the check point at Shichahai area. 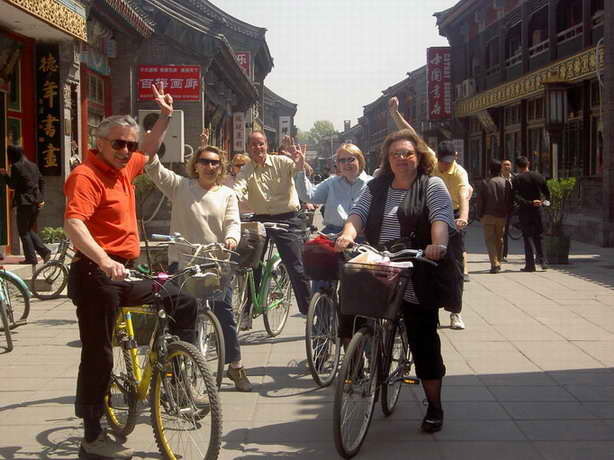 Arrive in the beautiful Qianhai lake area, get on the bike and start our trip. Have a short stop on the reputed Silver Ingot Bridge (Yindingqiao). Then head to the Houhai Lake area where many characteristic bars can be seen. Follow the traces of old Beijing in the old narrow hutong alleys. Arrive in the Former Residence of Song Qingling, a legendary female in China of the past century, the wife of Sun Yat-sen and the first and the only honorary president in PRC. Snacks at the Nine Gates Snacks will make your mouth water. Along the bank of lake, see the Wild Duck Island which is the paradise of the wild ducks and birds. Li Jia Cai is a famous imperial cuisine restaurant in Beijing. Then we come across the Liuyinjie Street, a famous old street district with several former palaces of old aristocracies. Prince Gong’s Mansion is the most popular, the largest mansion in Qing Dynasty. Return to the starting point.